Check out our Angular Book Series. 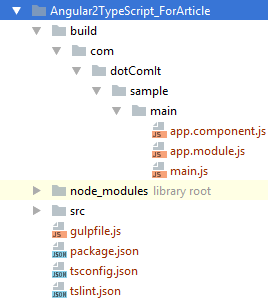 This is part of an ongoing series about building Angular 2 TypeScript applications with Gulp. Start with Part 1, and then read Part 2, Part 3, Part 4, Part 6. This creates a new Gulp task named build. The argument to the task is an array and each element of the array is a string which represents another Gulp task. We saw this approach with buildTS task built in Part 3. In that part, the tslint task was executed as part of the buildTS task. In this case, the build task does not have its own functionality it just combines together the existing tasks. All the tasks are run, creating a build. The next part of this series will show you how to delete everything in the build directory before creating the build. I call this approach a clean build. All the information is already available, so sign up for our newsletter to start reading right away. Get our expanded 38-page version: Building Angular 2 Applications with Gulp. We are ready to use Uglify in our script. The pipe() after tsProject() calls the uglify() method. We could configure the Uglify Script with various options, but for the purposes of this sample I used the default setup. This is a minimized version of the translated TypeScript code. It includes some SystemJS configuration that we didn't write manually--that was added by the TypeScript compilation. If you look closely, you see a lot of the function arguments are changed into single character values. White space and line breaks are removed. Other optimizations can be made by the Uglify library, such as variable definition optimizations. Such things are not present in the existing code. Run the final code in the browser, and you'll find it still runs as expected, and the source maps still work. The next few article in this series will talk about different build techniques, and some tasks I write to handle different options. The final article of this series will show you how to build a script that will recompile your code as changes are made on the fly. I launched a Kickstarter for an Angular 4 book. Check it out here. There are a lot of details on the Kickstarter page. I kept the price low, but that means I need a lot of backers. The full book will be released under a Creative Commons License upon completion. This is your chance to help me create a great tutorial resource for the Angular community. What are you waiting for? Back now! This is part of an ongoing series about building Angular 2 TypeScript applications with Gulp. Start with Part 1, and then read Part 2, Part 3, and Part 4. The plugin is now available to use within your gulp script. I like to keep my maps separate from the generated code, but you do not have to specify a separate path if you do not prefer. The second pipe calls the init() method on the source map module. The second to last pipe saves the source maps with the write() method. 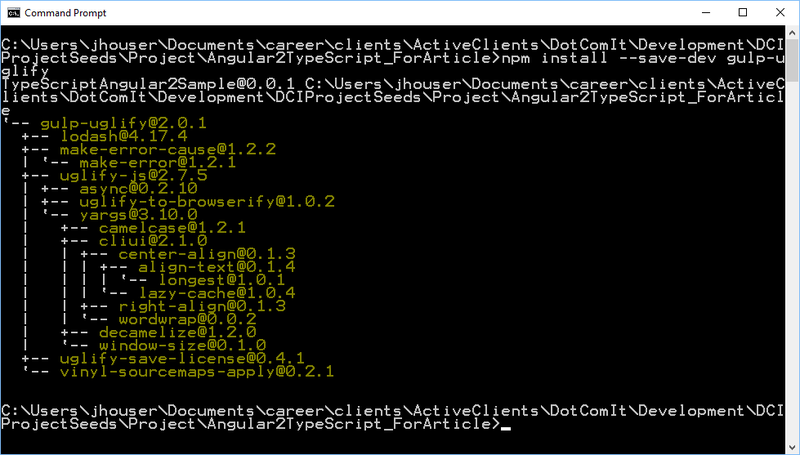 A source map was generated for each TypeScript source file. Success! The chrome dev tools let us drill down into the TypeScript files, just as we had written them. They support watches and breakpoints, just as if the browser was running them directly. This is a very useful debug tool. You can get all this information right now by signing up for my newsletter using the form below. Do it to help you become a better Angular 2 Developer. This is part of an ongoing series about building Angular 2 TypeScript applications with Gulp. Start with Part 1, and then read Part 2, and Part 3. The task is named copyAngularLibraries. It is simple. It takes the array as a source. The cwd flag with the src specifies the current working directory, meaning all the libraries are located in node_modules. Then the task specifies the destination path. 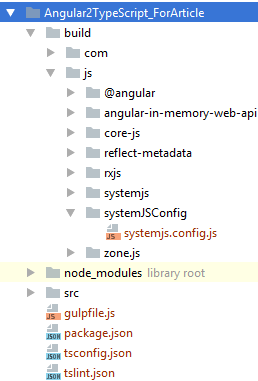 This will copy all the required angular files from the node_modules directory to the build/js directory. This is a simple task that specifies the input source and the destination. 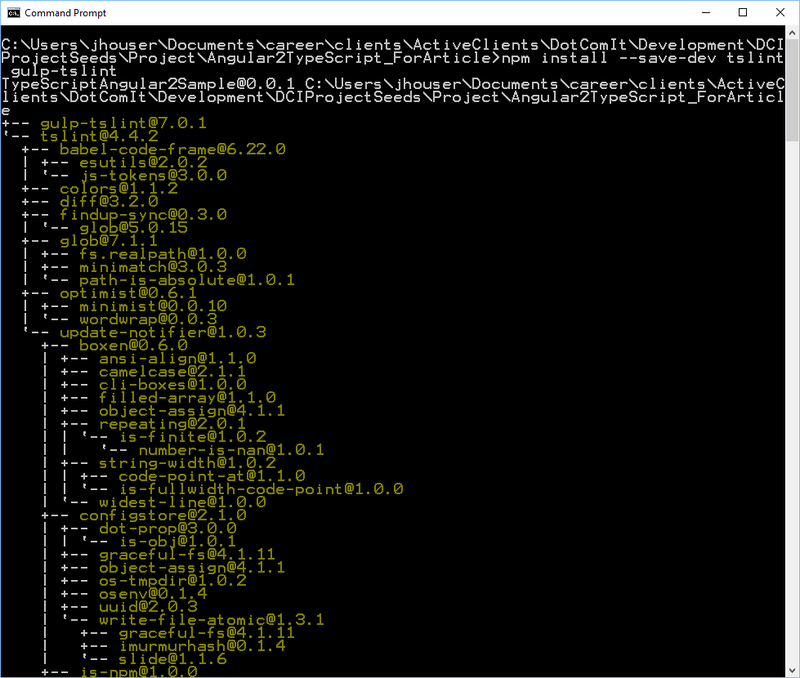 It uses the same destination variable that was used for the Angular libraries in the previous section. 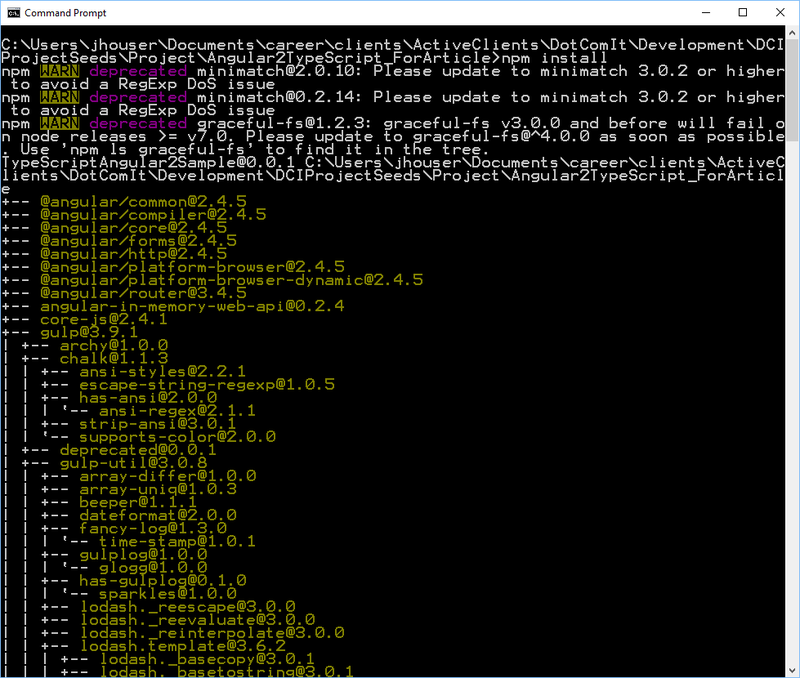 The systemjs.config.js file was successfully copied from the src directory to the build directory. The index.html file was successfully copied from the root of the src folder to the root of the build directory. Not an interesting app, but proof our scripts work. This is part of an ongoing series about building Angular 2 TypeScript applications with Gulp. Start with Part 1, and then read Part 2. First, install a gulp plugin, gulp-typescript. This makes the gulp-typescript plugin available for use in our gulpfile.js. The exclude option tells the type script project not to process files in the node_modules directory. 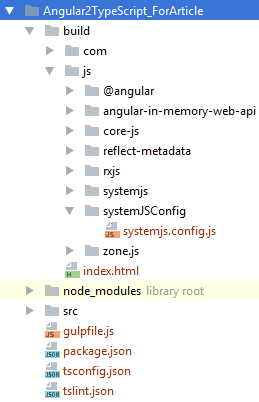 In essence, it ignores all the Angular libraries installed via NodeJS. These libraries already come with compiled bundles. We'll deal with moving those later. What the full script does is take all the TypeScript files in our source directory, run them through the gulp-typescript compiler, and save the output to a build directory. You can see from the output that both the tslint and buildTS process ran. No errors; so let's review the output. You'll recognize the require statement from the NodeJS code we are writing. However, browsers don't inherently support that. This is here because of commonJS module creation was specified in the compiler options. The systemJS library allows require() to be used in the browser, and that is what Angular 2 uses. This is part of an ongoing series about building Angular 2 TypeScript applications with Gulp. Check out Part 1 here. This section will build a Gulp task for Linting TypeScript. The lint tool is a syntax checker that looks for errors. First, install a NodeJS Plugin, tslint and a gulp plugin, gulp-tslint. This will make them available for use within our gulp script. This is split up into two variables. The first just points to the source directory and that will be used throughout our script. The second uses the sourceRoot to create a wildcard glob that will cover all existing type script files in the main directory. That is the completed task. Before we run it, we'll need to configure it. Specific configuration options are beyond the scope of this article. Put this tslint.json file, in your root directory and you'll be fine. 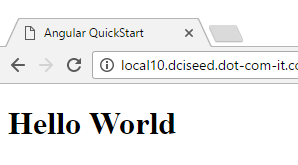 The file comes from the official Angular 2 Quickstart documentation. It correctly found the error. The lint process performs a syntax validation; it does not validate the code for accuracy of imports or other bugs; but those will be flagged as part of the compilation process which we'll tackle in part 3. I wrote an extended white paper on my Gulp process to compile Angular 2 TypeScript applications, and decided to turn some of it into a series of blog posts. The first part of this series will talk about the directory structure of the project, the initial setup, and SystemJS configuration. By the end of this series you'll have a good architecture for building Angular 2 applications with Gulp. 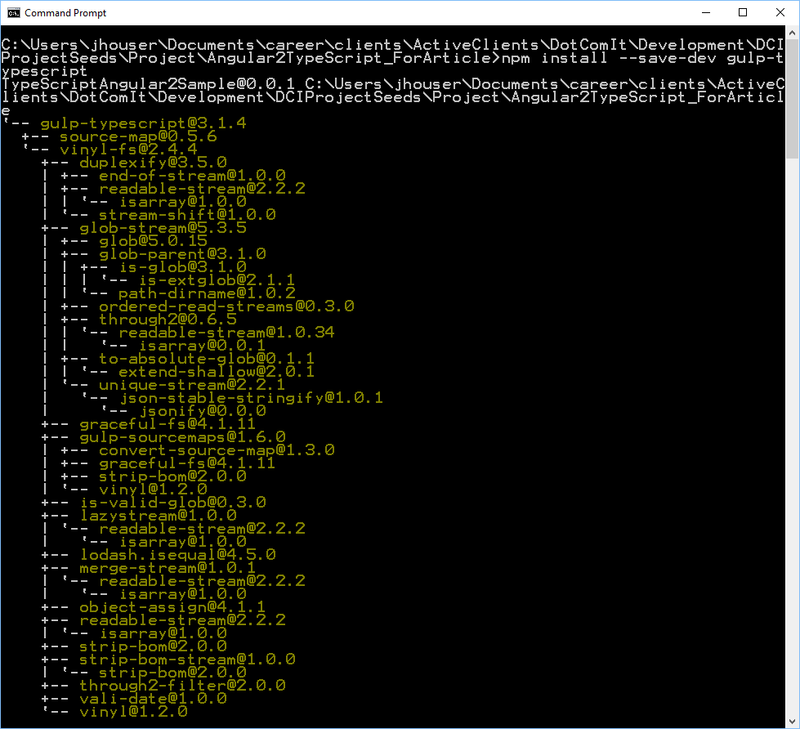 build: The directory where the compiled code is placed. The root will most contain the main index file. maps: Source Maps are placed in this directory, if they are generated. 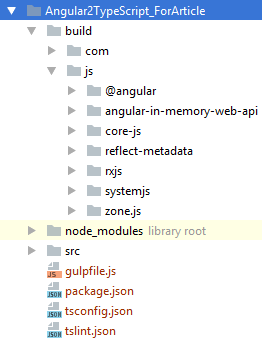 node_modules: A directory that contains relevant modules installed by Node, such as Gulp, TypeScript, and the Angular libraries. src: The directory where our source code goes. The root directory will contain the main index.html file, but not usually much else. com: Our TypeScript code is put in a com directory, mimicking the package structure of a lot of Java package code. I am not going to examine a sample TypeScript application in detail as part of this series. The GitHub repository includes a simple Hello World application, which will suffice for our demonstration purposes. 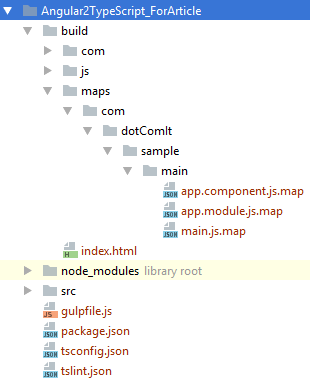 This creates the node_modules directory; and installs all the modules specified in the package.json, along with any related dependencies. This is the base we use for creating our build scripts. As we need Gulp plugins we'll install them individually in future installments. Angular 2 uses a module loader system named SystemJS to give the browser require() functionality like you'd use on the server side with NodeJS. We need to provide a configuration to SystemJS so that it knows how to find our custom app code, and the required Angular libraries. I put this file in the src/js/systemJSConfig directory. The map configuration tells the code 'when we reference 'x' in code; go look for this library. 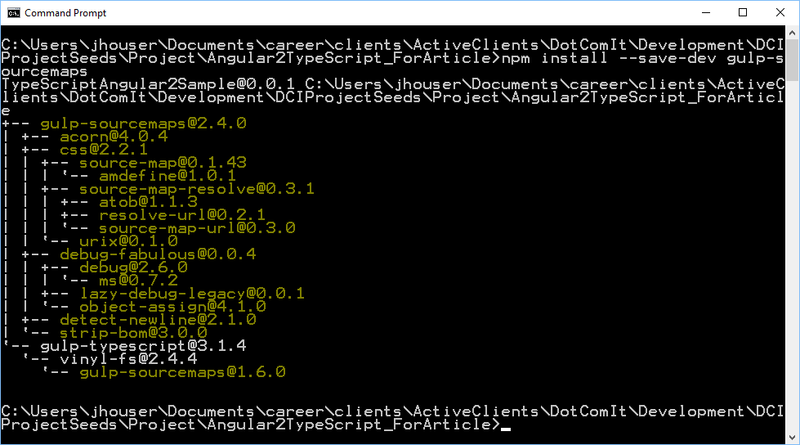 The main angular libraries are listed. Explanation of the Angular libraries are beyond the scope of this article. The important things to notice are that the js path is specified in the file location for most of the libraries. The second thing to notice is that the app map points to our com directory, where all our custom code is located. Two packages are specified. The first is app, which is our main application and custom code. It defines the main entry point, main.js--the name of the file that main.ts will be converted too. It also specifies the default extension of js. The second package specified is a package used by Angular, rxjs. 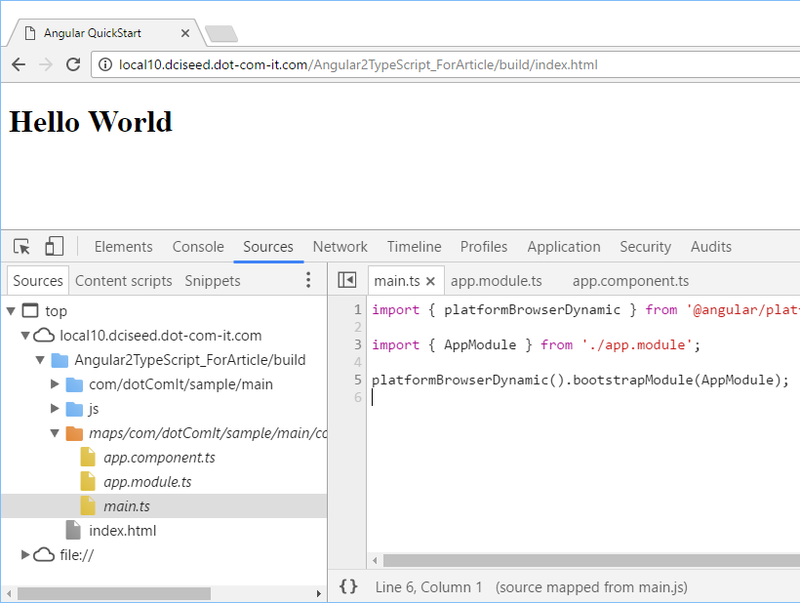 I wanted to cover the SystemJS configuration as part of this article because it is specific to getting Angular to work, but has nothing to do with TypeScript or creating Index files required for the application. I was working on a client's AngularJS project. When the user clicked a button to open another application, we wanted to make a service call to log the request and make sure we redirected the user to the right place. Some users would see different versions of the other application, and the service call told us the proper variables to pass to setup the secondary app. Unfortunately, after we made the service call the link would not open. I started to research for more information as to what the problem may be. A browser won't open external pages if they aren't done in response to a user interaction such as clicking a button. The browser assumed user request was ended by the time our service call ended and the promise object resolved. This is one solution we considered for the issue, which uses a form post to open the new link. By, the way, this is the fourth in the series about opening links through AngularJS. Check out the first and second, and third . Three elements are injected into the controller. $scope is the common service used to communicate between the view and the controller. $window gives you an Angular reference to the browser's window object. We'll use $window to open the new page. Finally, $q is added. We are going to use $q to create a promise object to simulate an actual remote service call. This code contains two buttons; one that will successfully open the page and another that will not--as if the service call was rejected for reason. Both call the same onButtonClick method, passing in a Boolean value specifying whether the link should be open or not. An ID is specified, and we'll use this to get a hook to the form inside the angular code. Target is specified, and tells the form to submit to the window named 'myNewWindow'. The form action will post go back to my blog--however you could post it anywhere you want, even passing variables for processing. This uses $window.open() to open the new window and it opens to a blank about page. The angular.element is used to get a handle to the form based on the form's ID. This uses JQuery under the hood, but did not work w/ the JQuery lite that is part of AngularJS, so that is why we had to use the full Jquery library earlier. The failure function will close the new window we created. The success function will submit the form to the new window we just opened. The decision is made based on the value of the openOrClose argument passed into the onButtonClick() method. A boring UI. Click the 'refuse' button and the service call is so quick and the window will close as quick as it would open. The user may see a blink, or anomaly in the UI. This is undesirable, but I don't know of another way. The link to my blog will open in a new tab, based on my default browser settings. Play with the code here. This was an interesting experiment, and it suited my client's need at the time. I always have caution about opening and controlling third party windows on the client's browser; because I don't want to build apps that overstep their bounds. I was working on a client's AngularJS project. When the user clicked a button to open another application, we wanted to make a service call to log the request and make sure we redirected the user to the right place. Some users would see different versions of the other application, and the service call told us the proper variables to pass. Unfortunately, after we made the service call the link would not open. I started to research for more information as to what the problem may be. Basically, a browser won't open external pages if they aren't done in response to a user interaction such as clicking a button. The browser assumed user request was ended by the time our promise object resolved. This is how I solved the issue. By, the way, this is the third in the series about opening links through AngularJS. Check out the first and second. The failure function will close the new window we created. The success function will change the location of the window, in essence opening the new page. A boring UI. Click the 'refuse' button and the service call is so quick and the window will close as quick as it would open. This is undesirable, but I don't know of another way. The user may see a blink. The final entry in this series will show you how to submit a form post after asynchronously making a call. That will be out next week. BlogCFC was created by Raymond Camden. This blog is running version 5.9.2.002.